Posted on August 24, 2013 by Ching under Travel. 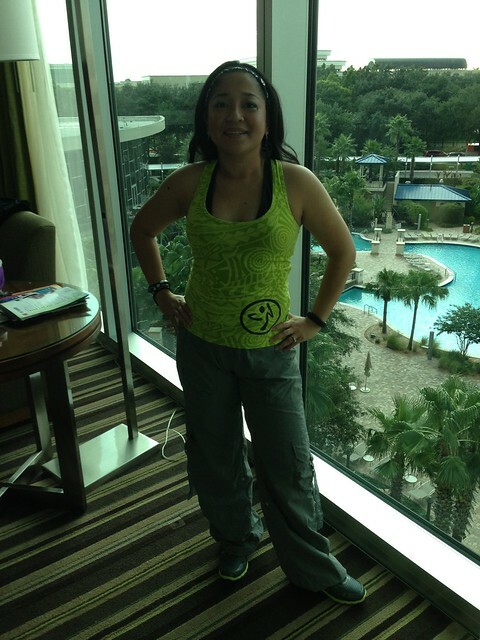 While attending the 2013 Zumba Instructor Convention, Brian and I stayed at the Peabody Orlando. Many of the activities happen in the Peabody convention center area like the kick off and keynote, live concert, and the ZIN (Zumba Instructor Network) soiree or costume/theme party so this is really the way to go. That way if you ever dress up in heels you don’t have to walk several miles, which is what the people who stayed at the Hilton had to do every time because there isn’t a faster way around than to go through the massive Orange County Convention Center (OCCC). At least there are covered walkways between the Peabody, OCCC, and the Hilton so you don’t have to cross any streets and you’re not walking in the rain. It’s still a long walk, though. Brian and I definitely got our exercise just in walking alone. Anyway, I think everyone had the same idea (of staying at the Peabody) because this is what greeted us when we arrived at the hotel. 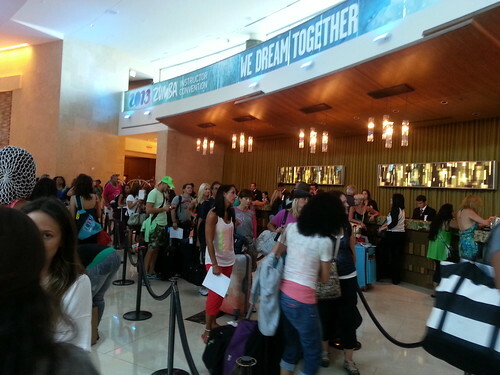 The check in lines were long pretty much all day on Wednesday, which is when most people arrived. Brian and I agreed that, if we do this again, we will plan to arrive a day or two before convention registration begins to avoid the craziness at the check in desk. We got an amazing corner room on the fifth floor with great views of the marsh on one side and the Peabody pool on the other. Since our room was on the corner, two of our walls consisted of floor to ceiling windows. It was awesome. We kept the curtains open pretty much the entire time. 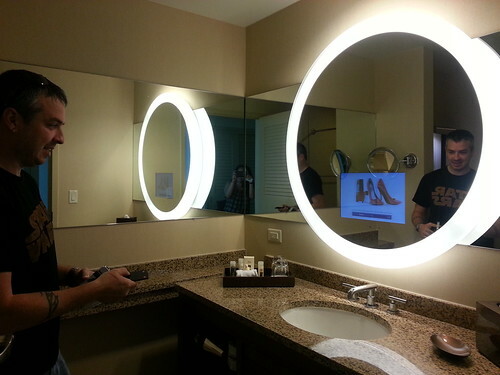 While I was most excited about our floor to ceiling windows and fantastic view, Brian was most excited about the electric mirror with the built-in TV. He was like, “I’d probably get around faster in the morning if we had one of these at home.” Right now he spends 30 minutes every morning in our breakfast area in the kitchen to watch Wake Up with Al while eating his cereal. 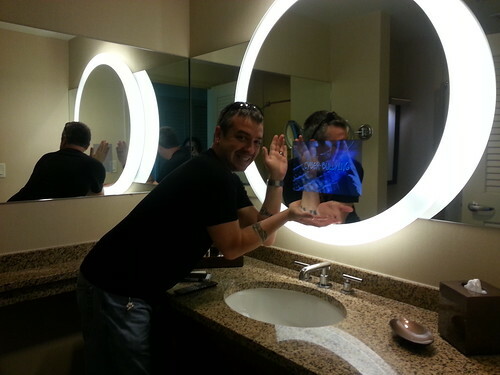 The mirror TV had to be Brian’s favorite room amenity, hands down. I thought the duck soaps were a nice touch also. The housekeeper assigned to our section is a Filipina. I never did meet her but Brian had a chance to visit with her on a couple of occasions while he was waiting for me in between sessions. Anyway, she brought us three of these duck soaps during the course of our five-night stay. I took two of them home because I thought they were cute. I left the other one there because I accidentally dropped it and broke its bill. I didn’t want a defective duck. LOL. 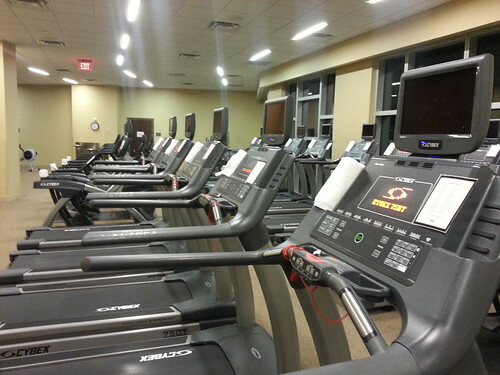 The Peabody has an amazing fitness center with separate areas for cardio, core work, and weights. The fitness center also has a 1,000 square-foot studio for group fitness exercise and a 500 square-foot studio dedicated to spinning. 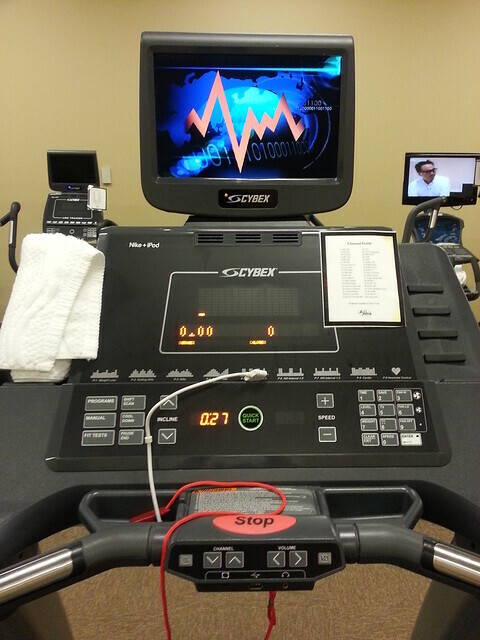 They have top of the line Cybex and Octane cardio machines that even have iPod hook ups. Seriously. 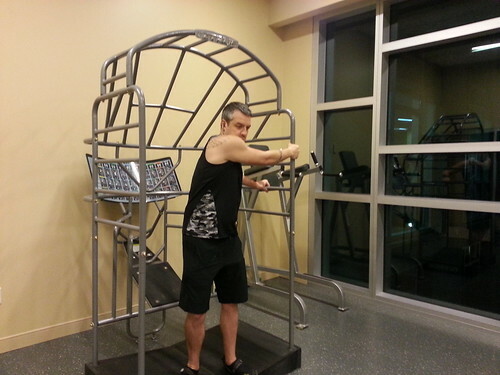 This hotel fitness center puts most gyms to shame. Brian and I were so impressed that we just had to use it. LOL. I normally get up to take my medication at 4 AM Central time so in Orlando I had to get up at 5 AM to take it. The gym opens at 5:30 AM each morning so we had this crazy idea to work out every morning at 5:30 AM. Well, it only worked the first morning because after the first full day of convention I was so exhausted that I could barely get up to take my pill the next day. It was pretty much that way the rest of our stay. I’m glad we got to experience the fitness center at least once, though. Anyway, we may have been the first ones there that morning but we weren’t alone. Several people had the same idea. Shortly after we started working out there was a group of ten or so people who went into the group exercise studio for an early morning Zumba class. I was tempted to join them, but I didn’t want to intrude on their private Zumba session. There were also a couple of other folks in the cardio room and a few people in the weight room. There were a lot more people than I expected to be awake before 6 AM for sure but nothing that the 8,000 square-foot fitness center couldn’t accommodate. Also check out the Peabody web site for the weekly group fitness schedule. They have core strengthening classes, yoga, pilates, spin, cardio, conditioning, and boot camp classes throughout the week. Like I said, the hotel gym at the Peabody is even better than some of the gyms we have here in Wichita. That alone is worth the stay. 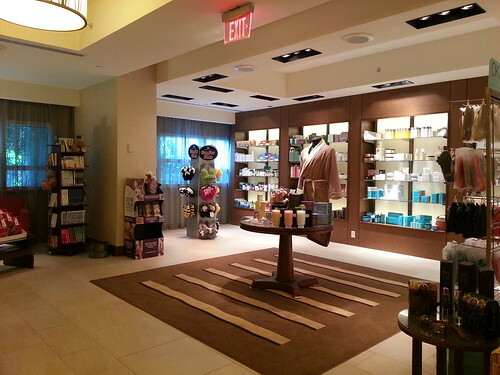 This is a picture of the spa gift shop. We went there one day to see if they could do something about Brian’s foot blisters. They didn’t have a so solution for him other than to go to Walgreens or CVS for some foot/blister pads. 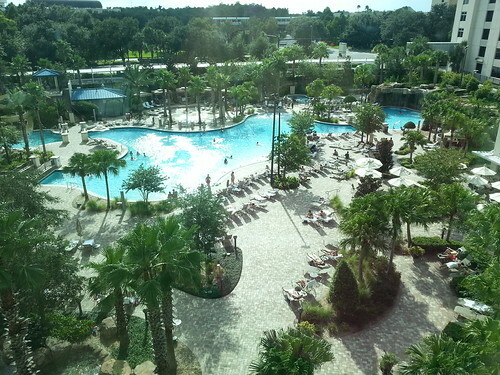 The Peabody Orlando has its limitations after all. While Brian got to spend a lot of time at the pool, I didn’t get to hang out at the pool until my last day. As soon as my final workshop (Mastering the Warm Up and Cool Down with Tony Witt) was over, we went straight for the pool. Apparently, everyone had the same idea because even Gina Grant was there. 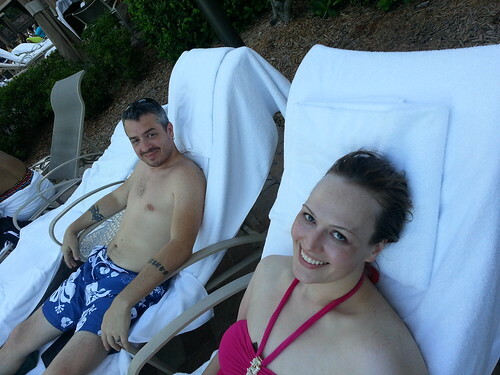 Here’s a picture of Brian and Christina at the pool. Once all the Zumba convention took over the pool, it wasn’t long before a random Aqua Zumba session broke out. Yep. That’s Gina at the front leading the crowd. Her kids even joined in. Here’s another one of Brian and Christina. I’m really glad that Christina joined us because Brian’s a bit of a party pooper. He wouldn’t go to the water slide with me. Christina and I did it together and had a blast. Anyway, there’s so much to do just in the hotel itself that you could have a great time without leaving the premise, which is pretty much what Brian ended up doing because it wouldn’t stop raining. It rained every single day that we were there. Lucky for me, I was indoors most of the time. Mental note for next time though: stay a few days longer so we can actually do some sight-seeing. We were there for five days, but it went in the blink of an eye. We woke up one day and it was time to leave. We requested that Rahi (the same driver who greeted us at the airport) pick us up from the hotel and drive us back to the airport because he did a really good job. He was so prompt. 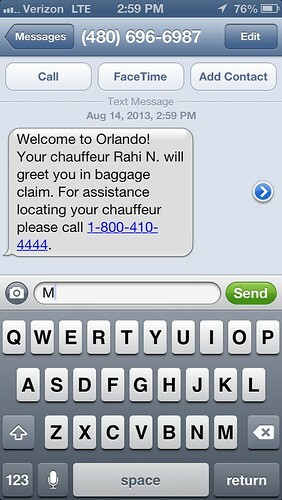 As soon as our plane landed in Orlando (MCO), we even got a text message on Brian’s phone that he was waiting for us. 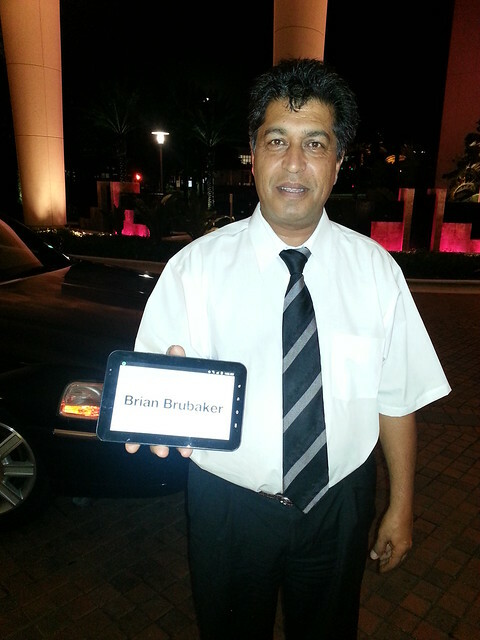 Sure enough, he was there at baggage claim dressed in a spiffy suit, holding a tablet with “BRIAN BRUBAKER” displayed on the screen. 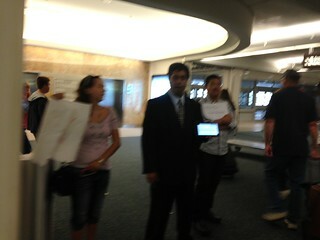 He knew what we looked like but he had the same sign on his tablet when he came to pick us up on our departure. For our next trip, we will definitely request Rahi again for our driver. Also definitely staying at the Peabody. It’s the best way to go when you’re attending the Zumba Instructor Convention. Until next year! 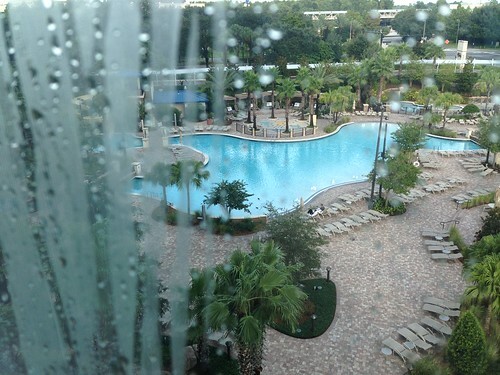 Replies to "The Peabody Orlando"
I went to the gym almost every evening. And I agree, we need to come in earlier next time to do a little sightseeing and go play at the theme parks.